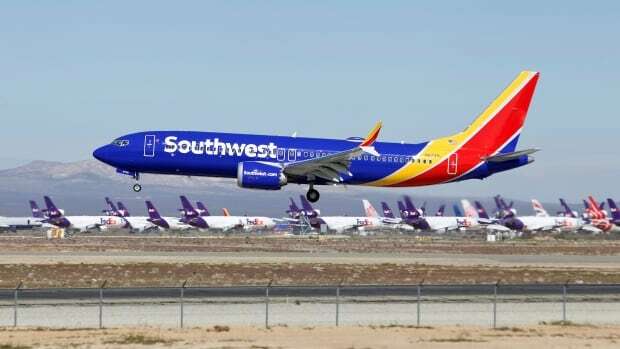 A Southwest Airlines Boeing 737 Max made a safe emergency landing Tuesday in Orlando after experiencing an engine problem, the Federal Aviation Administration said. The crew declared an emergency after taking off from Orlando International Airport around 2:50 p.m. ET and returned to the airport safely. No passengers were on board and the aircraft was being ferried to Victorville, Calif., where Southwest stores the airplanes. The 737 Max was grounded in the U.S. on March 13, three days after a deadly crash involving a Max in Ethiopia. It was the second fatal crash involving the airplane. U.S. airlines are allowed to shuttle the planes, but cannot carry passengers. The Federal Aviation Administration said it’s investigating but the emergency was not related to anti-stall software that is suspected as a cause of the two fatal crashes including one last year involving a plane from Indonesia. Airport spokesperson Carolyn Fennell said one of the airport’s three runways was shut down for cleaning after the landing. She said it’s standard procedure to check a runway for debris after an emergency landing. It wasn’t clear if any parts actually fell off the plane. Fennell said the airport’s other two runways remained open and normal operations weren’t affected. FAA oversight and its program to allow manufacturers and airlines to have their own employees do inspections will be examined at Wednesday’s hearing by the Senate commerce committee’s aviation subcommittee. The agency plans by July to develop new evaluation criteria for training and company self-audits, Calvin Scovel III, the Transportation Department’s inspector general, wrote in his prepared remarks to the Senate committee obtained by The Associated Press. “While revamping FAA’s oversight process will be an important step, continued management attention will be key to ensure the agency identifies and monitors the highest-risk areas of aircraft certification,” Scovel wrote. Also in prepared testimony, the acting FAA head Daniel Elwell is expected to defend his agency’s certification of the 737 Max and its initial resistance to ground the planes until all other major aviation regulators around the world had done so.